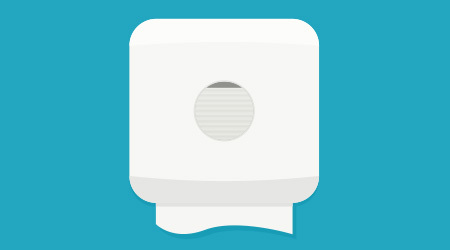 This is the first part of a three-part article about restroom odor control. Odors are perhaps the greatest restroom offender and one that creates an immediate negative first impression, says Glen Huizenga, a sales leader for Nichols, a Norton Shores, Michigan-based distributor of janitorial supplies. For this reason, odor must be a top consideration for building service contractors, especially in health care settings, where the cleanliness of the facility correlates to the perception of care, and in restaurants, where it correlates to the cleanliness of the kitchen. “People think, if they can’t keep the restrooms clean, then what is the rest of the facility like?” says Huizenga. There are two ways to deal with odor, says Huizenga, who worked on the custodial side of the industry for years before moving into distributor sales. BSCs can use a masking-type product that pushes fragrance out and changes the molecular structure of an odor to cover it up. Or they can use cleaning products that work biologically by seeking out the protein causing the odor, consuming it and leaving a byproduct of carbon dioxide and water behind. The best restroom odor control systems use both methods, he says. For example, in a men’s restroom, which at times can have an overpowering smell of urine, a masking agent might be helpful. However, the biological method is also needed to remove urine proteins from grout lines to ensure odors do not linger. People also know a clean restroom — or any room for that matter — shouldn’t have an overpowering fragrance smell, he says. “If you go into a nursing home and all you can smell are fragrances, something’s wrong, because what are they trying to cover up?” says Huizenga.